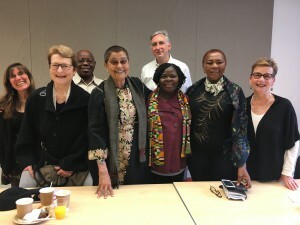 On April 21st, the Center for the Study of Social Difference sponsored a presentation and discussion of work in progress by the CSSD working group The Rural-Urban Interface: Gender and Poverty in Ghana and Kenya, Statistics and Stories. This public event featured a conversation among Gayatri Chakravorty Spivak, University Professor in the Humanities at Columbia University; Reinhold Martin, Professor of Architecture at Columbia University; and Ben Baer, Associate Professor of Comparative Literature at Princeton University, followed by a presentation of work by Helen Yitah and Aloysius Denkabe, Professors of English at the University of Ghana-Lagon; and Wanjiru Gichuhi, Professor of Population Studies at the University of Nairobi. Juan Obarrio, Associate Professor of Anthropology at Johns Hopkins University, served as discussant. The Rural-Urban Interface: Gender and Poverty in Ghana and Kenya, Statistics and Stories project is an Africa-led research endeavor that brings together the humanities and the social sciences. Professors Yitah, Denkabe, and Gichuhi have for the past two years been conducting interviews with rural-to-urban migrants in Accra and Nairobi. They showed a selection of video clips from these interviews that featured migrant women narrating experiences of their rural background and current urban situation. In their analysis, Professors Yitah, Denkabe, and Gichuhi noted that these interviews are not only about the rural-urban interface but are also constitutive of that space. The entire effort is an enhancement of current interviewing techniques by harnessing the humanities for “development.” The project relates to previous work by all of the African participants. Professor Spivak opened the occasion by emphasizing that they have been working together, in Africa, in New York, and by Skype to fine-tune the interviewer-interviewee relationship. The idea is to allow interviewees to offer their narratives in response to the interviewers’ new technique of listening rather than presenting prepared questions. She introduced the methodological question of “harnessing the humanities for development.” Rather than produce existentially impoverished statistics to feed into the development stakeholders, the project attempts to draw out narratives from the interlocutors by attending closely to rich moments in their discourse. Professor Spivak emphasized that this process requires an “unlearning” of disciplinary patterns in order to produce the response as genuinely coming from the other’s side instead of determined by the questions. Professor Martin offered a reading of the term “interface.” Much has been written about what used to be called the city-country relation, and it is by now common knowledge that these spaces cannot be held apart. The interface is not something that can be securely held in place or time—geography or history. It is an event that happens over and over again with repeatable differences for individuals and collectives. In viewing the interviews as events of the interface, Professor Martin addressed the question of the interviews’ staging, whether in a conference room with signifiers of institutional seriousness, or at a less formal home visit with neighbors nearby. He posed the question of what role these stagings play in determining the content of the conversation. Professor Obarrio suggested that the “politics of the interview”—constituted by the signifiers of the setting, the hierarchy between interviewer and interviewee, and the language(s) used—must be attended to alongside the “poetics of the interview”—the format in which the narrative emerges or is imposed. Professor Baer pointed to a strong counter tradition in existence since the nineteenth century that combined statistics and narrative to promote social justice. He suggested that the many signs of class differences visible in the mises en scène of the interviews constituted an important part of the overall text. Professor Baer also examined the institutional and epistemological differences between the Accra and Nairobi interviews so as to underline the way in which the project is itself a part of the rural/urban interface rather than in an analytic exteriority to it. He suggested that the question-form is an important aspect of the work (having a phatic rather than interrogative function), with potential to open onto unexpected response rather than predicted or anticipated answer. Professor Denkabe reflected that the self-critique that emerged from the discussions of the first batch of interviews produced a methodological conundrum. He and Professor Yitah had originally conducted interviews with a semi-structured format but eventually concluded that they were really speaking to themselves and transforming the narratives they were hearing into answers to a pre-determined set of questions, rather than listening to the respondents. This led to the question of, What is research? What can the humanities contribute methodologically? In response, Professor Spivak explored existing work on interviewing techniques and shared her findings with the entire group. The second year of interviews was approached with new strategies: not to draw out answers to pre-thought questions; rather, to draw the narrative out with leading questions; to watch out for moments of intensity highlighted by facial expression, tonal shifts, and posture. The gaps and contradictions that emerge give an opportunity for imaginative entry into what it means to be an African entrant into the next megalopolis. An audience member asked what happens after the end of the interview to the power structure between interviewer and interviewee. Professor Gichuhi responded that after the interview, interviewees are given the opportunity to ask any question, and the implicit question is usually the interviewee wondering what they will get from this process in terms of what it means to them. Professor Yitah added that there is often follow-up after the interviews, with interviewees given the opportunity to add anything they left out. Professor Spivak added that the question perhaps referred to a continuing relationship. The discussion ended with an emphasis on the ongoing nature of this project, and the hope to continue the conversation at another Columbia event the following year. Photos from the discussion are located here.